My goodness, the first day of Autumn is on Friday the 22nd! 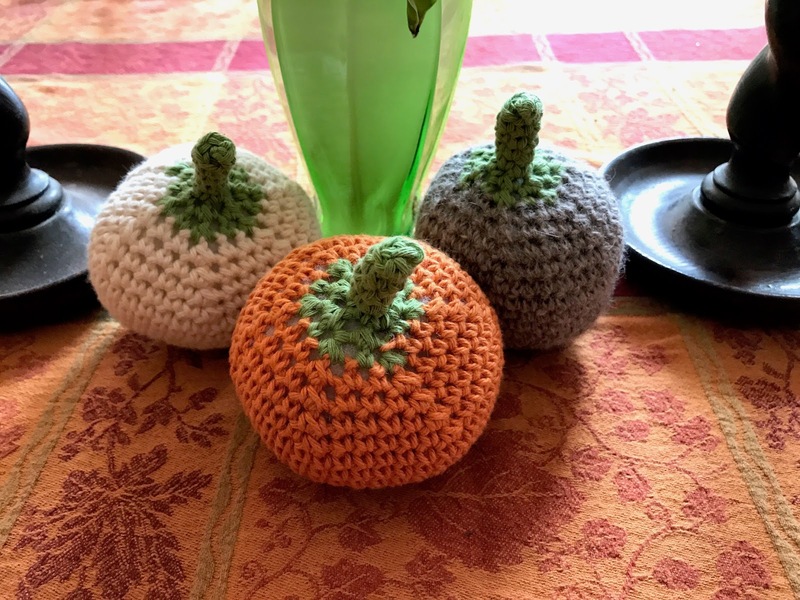 I put on a fall tablecloth and found 3 of my crocheted pumpkins for a small start on my seasonal decor. Yesterday I was the only adult home when the boys got home from school so I dutifully went out to wait for the bus. I only took my shawl and boy was I freezing! The wind was blowing and it was downright cold. I pulled it up over my head like a babushka. 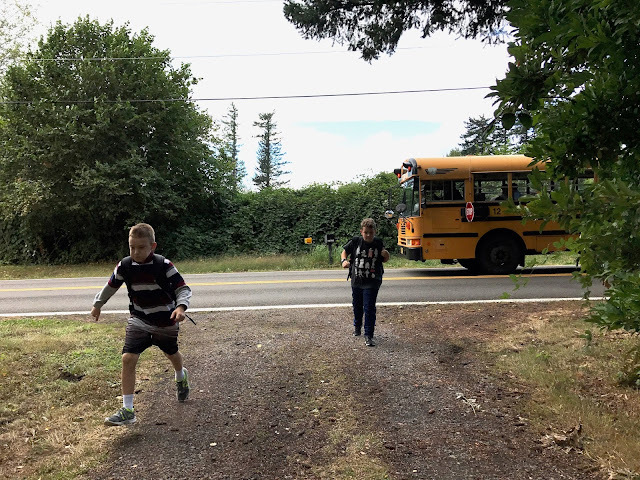 The bus pulled up and I barely captured the boys running by before ::whoosh:: they were past me! They are being so good while their parents are away for 11 days! They went out deep sea fishing in Hawaii yesterday and caught some snapper fish. Since finishing Caleb's hat I've gone back to working on the baby blanket I'm making. I'm using my Shells on the Half Shell pattern I devised. I really like the little shells this pattern makes and it's so easy to do. I'm using the Red Heart Unforgettable yarn, color "Candied". I confess I'm obsessed with this yarn. It's so fun to use and it's soft. Another shot of the devastation. Today I am trying to keep up with commenting on blogs. I have been a bit lazy of late. I have been enjoying time with my Kindle :) You seem like you have a great relationship with your grandsons. Love that baby blanket! 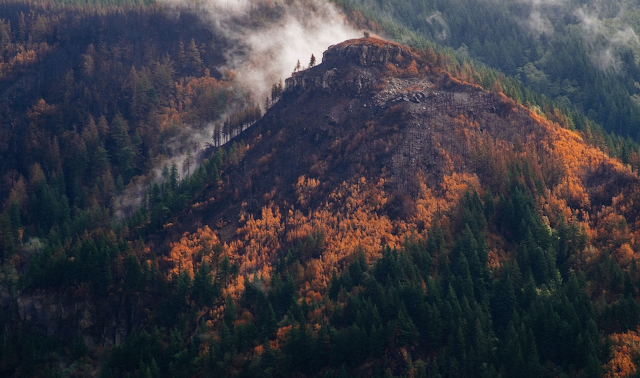 So sad about the fire in the gorge; this has been the craziest summer yet in the PNW. We've had a little rain here, but it's still quite dry, but every bit helps, right? 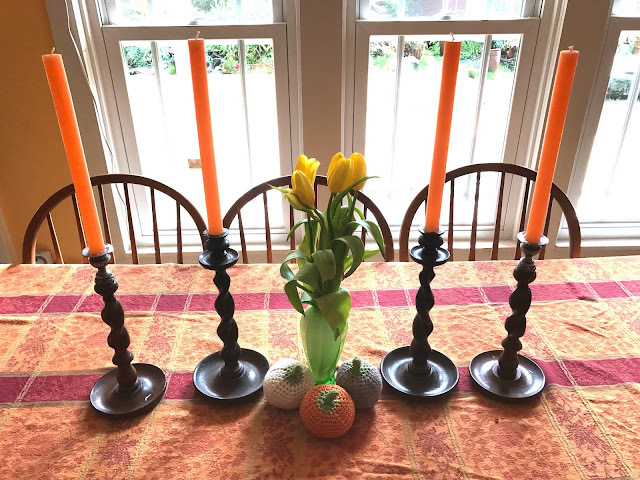 Worked then shopped at Bauman farm before home. I'm tired but need to get a few things done before bed time. 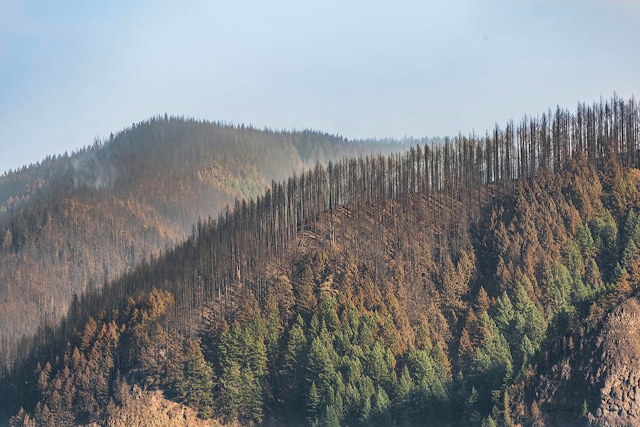 The photos the hills are sad and people losing jobs for awhile is not good. Oh my goodness. It's chilly here too and heat's been on too. Stay warm Teresa! Glad Gracie is back so u can swim together. Such a shame about the loss of jobs, praying that they will find some new employment. I smiled at the babushka photo, your shawl looked so beautiful. 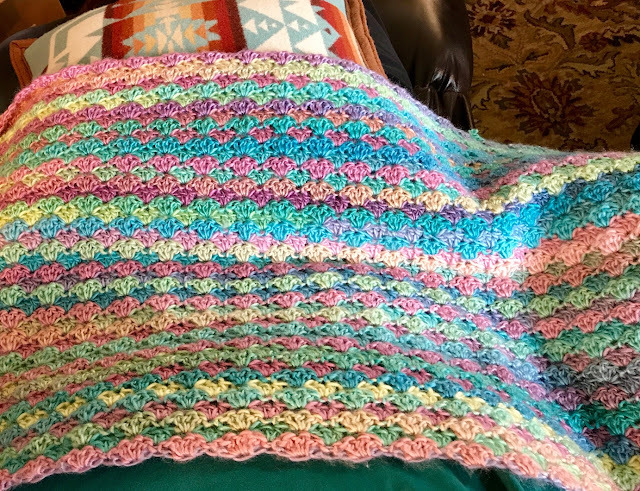 Love the pattern and yarn of the blanket. I am finishing off the work in the fireplace and cleaning today. Oh babushka is speaking my language!! So sorry about those fires. Glad at least some of the fire is contained. Cooler weather will help, rain will help the most. You are a wonderful grandparent to watch the boys for so long. I know they are happy to be home with both you and Dayle. Enjoy the cooler weather, it is still in the 90's here. Hope you enjoyed your swim:) I spent the morning with a crochet group I've set up (more on that on my blog soon!) and then took the children for haircuts. 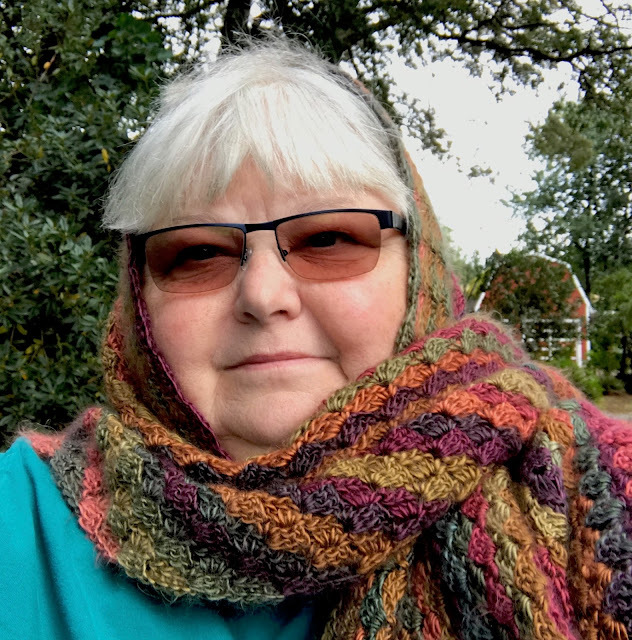 Love your shawl, and your blanket, the colours in both are fab! This made me smile, they certainly are whooshing past!